BETHLEHEM, Palestinian Territories — Down a Bethlehem alleyway, sunlight illuminates a golden icon of the Virgin Mary and Jesus, signalling the revival of an ancient art being practised in the workshop inside. The building near the Church of the Nativity — the site where Christians believe Jesus was born — houses a group of enthusiasts specialising in the sacred art of iconography. They are doing so some 2,000 years after Christian iconography began in nearby Jerusalem — also where Christians believe Jesus was resurrected after his crucifixion, to be commemorated this Sunday for Easter. They work in both silence and in prayer, with their art a far cry from the cheap mass-produced icons sold in souvenir shops to tourists and pilgrims. “Icons are not commercial objects for us, but holy images that we honour,” said Nicola Juha, who heads the Bethlehem Icon Centre. He explains that icons like theirs are used by worshippers who, for example, light candles before them and pray. According to tradition, Luke the Evangelist painted the first Christian icon in 60 AD. 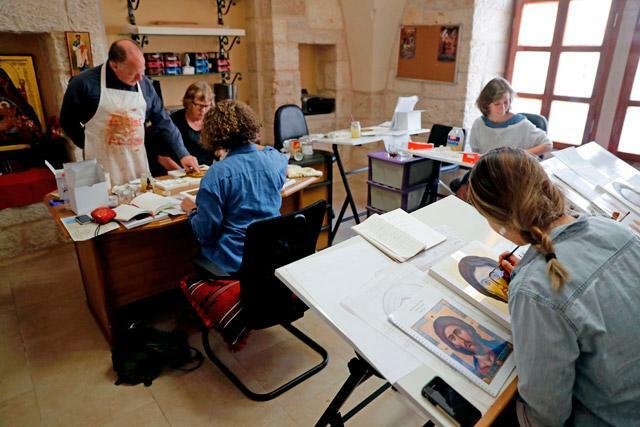 Ian Knowles, far from his native Britain, now teaches the same art to not only Palestinian Christians, but also those from countries including Canada and Poland. Watching the meticulous brushstrokes of his students, he said he left home to spend two weeks in the region and was still there nine years later. One of his pieces, “Our Lady of Palestine”, depicts Mary shedding a tear over symbols of the Holy Land — Jerusalem, Mount Carmel and Mount Nebo. In a nearby chapel with a blue ceiling and a Nativity scene, around a dozen students recite prayers, their nearly finished icons in hand. Archbishop Joseph Jules Zerey of the Melkite Greek Catholic Church, which sponsors the iconography centre, blesses each one, holding an olive branch with holy oil.